I mentioned recently that I've been reading more YA than younger children's books because my local library purchases a lot of series titles, which just don't attract me. However, I made an effort and tried a couple of books from the Horrid Henry series. I think it's fair to say that that title pretty much sums up the star of these books. Henry really is horrid. You know, a lot of kids' books will be about some nasty sprite who is redeemed in the end, and we can all feel warm and fuzzy about it. Not Henry. It took a while for me to warm to the first book because the author, Francesca Simon, uses a lot of cute names for her characters like Perfect Peter and Moody Margaret and, well, Horrid Henry, for that matter. But I'm willing to concede that child readers may like them, and the books are for them, not for me. What won me over is that the books are collections of short stories, and Simon really is able to write short stories for younger readers around child subjects. Henry's unrelenting horridness works for me, too. Simon has broken the writing rule about creating a main character readers will want to identify with, and good for her. I doubt identifying with Henry is why kids read these books. I think the draw here is that children know horrid kids. The mere fact that these stories of a horrid child exist validates readers' experience. These books prove that the adult world knows about the Horrid Henries of this world. They're writing books about them instead of making them straighten out, but, still, it must be a relief to read these things and think, There. Someone else knows a guy like the monster in Ms. Dufrane's classroom. I was discussing these books at lunch Saturday and misspoke because of the familiarity between the title of this series and the one about Horrible Harry. 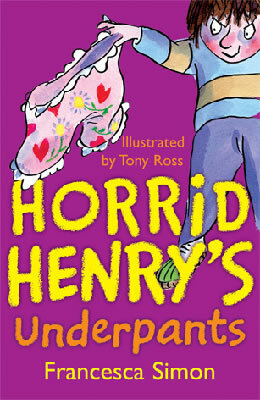 It's been years since I've read a Horrible Harry title, and I don't recall him being as truly dreadful to child and adult alike as Horrid Henry is. One of my lunch companions asked if Horrid Henry is British. Indeed, he is. Notice the cover above with the title Horrid Henry and the Bogey Babysitter? 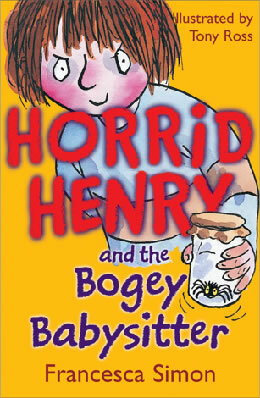 The book I read was called Horrid Henry and the Scary Sitter, obviously translated into American from the British.